No Need for a New House When You Fix the Door! Having a proper size birdhouse entrance hole is essential for a safe house that will protect nesting birds and their offspring, but holes often get damaged by wear and use. Fixing a hole is not difficult, however, and can keep a familiar, attractive birdhouse usable for many more nesting seasons. Birdhouse holes can gradually be damaged just from simple use. As adult birds move in and out of the entrance dozens of times a day, they grip the edge with their sharp talons and rub against it with their bodies and feathers. Fledglings may also damage the hole by pecking at it as they wait for their next meal or explore whatever they can reach. Predators such as raccoons, rats, squirrels, or mice will also claw or chew on the hole to attempt to reach the eggs or chicks for an easy meal. Even smaller visitors, such as mites or insects, can damage the surface and cause decay. Over time, even small scratches and nibbles can add up, gradually increasing the size of the entrance hole. If a house entrance hole grows just 1/8 or 1/4 of an inch, different species such as the house sparrow or European starling can get inside and may evict, injure, or even kill nesting or brooding birds. Similarly, predators such as cats and raccoons can more easily reach through larger holes. But the risk from predators is only one problem that a larger entrance hole can create. Parent birds may grow insecure if the entrance to their home is too large, and they could decide to abandon their nest or chicks if they feel the risk is too great. A larger hole may also permit excessive rain or wind into the house, which could drown or chill the nestlings, causing illness or death. Excessive sun shining through the hole onto the birds could also cause them to overheat and suffer from heat stroke. Because of these problems, it is always best to regularly measure birdhouse entrance holes and ensure they are not getting bigger. If they are growing larger, fixing them can help minimize any problems and keep birds interested in the house. Cover Plates: Adding an extra cover plate over the existing hole is the easiest way to repair a birdhouse entrance. Ideally, the plate should be made of a sturdy material that will resist chewing, gnawing, or scratches, such as sheet metal, tile, stone, or thick plastic. Center the new hole in the plate, and double check that the new entrance is the proper dimension for the birds that use the house. Smooth rough edges around the hole's rim so it will not tempt young birds to chew or will not injure birds as they move in and out. The plate could be nailed or screwed in place, or can be attached with a strong, all-weather glue. Hole Extenders: Adding a thick extender to create a small tunnel leading into the birdhouse is a great way to repair an enlarged entrance hole. This type of birdhouse hole protector will also provide extra shelter from the weather and make it more difficult for predators to reach deeply inside the house. Commercial hole extenders are available either as plain plastic tubes or decorative versions that resemble thick natural branches. It is easy to drill a hole extender through a thick block of wood and attach it to the front of the house over the existing hole, just as a cover plate is attached. New Entrance Panels: When an entrance hole has been severely damaged or the house needs additional repairs, it may be best to replace the entire front panel of the house. This will not only add a new, sturdy hole of the proper size, but will ensure the front panel is secure and not suffering from any cracks or warping. A thicker front panel can provide extra protection and insulation for the entire house. Replacing the panel is also a good time to thoroughly clean the birdhouse and make any other repairs that are needed as well. Once the entrance is fixed and is again the proper size for the birds you want as residents, it is important to take additional steps to make the house attractive to nesting birds and protect it from predators. Use the proper birdhouse dimensions for interior height and floor area so the birds have enough space for a growing brood. Use baffles and other techniques to protect the birdhouse from predators and keep the birds safe no matter how large or small the entrance hole may be. If a completely new house is needed, opt for a house made from thick, pest-resistant recycled plastic or other durable materials that are resistant to damage around the entrance hole. Over time, birdhouse entrance holes can be dangerously enlarged and put nesting birds at risk. 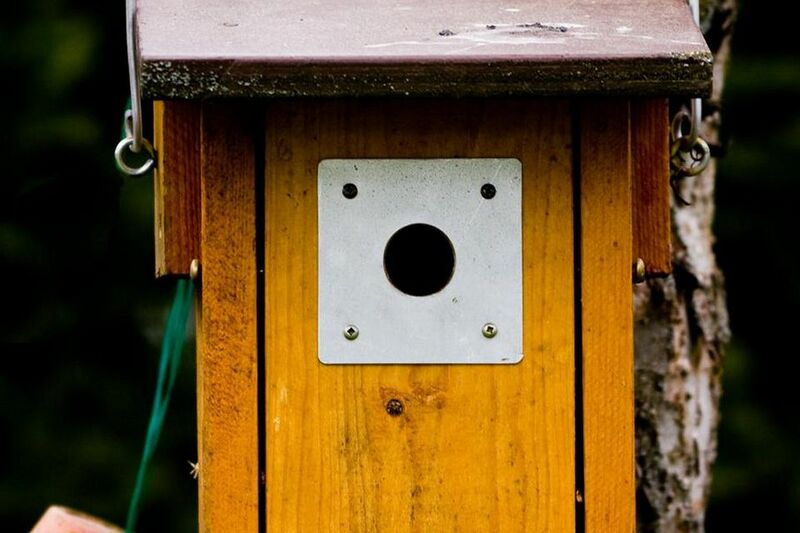 There are easy ways to fix birdhouse entrances, however, and every cavity-nesting bird can have a safe, secure home to use during breeding season.